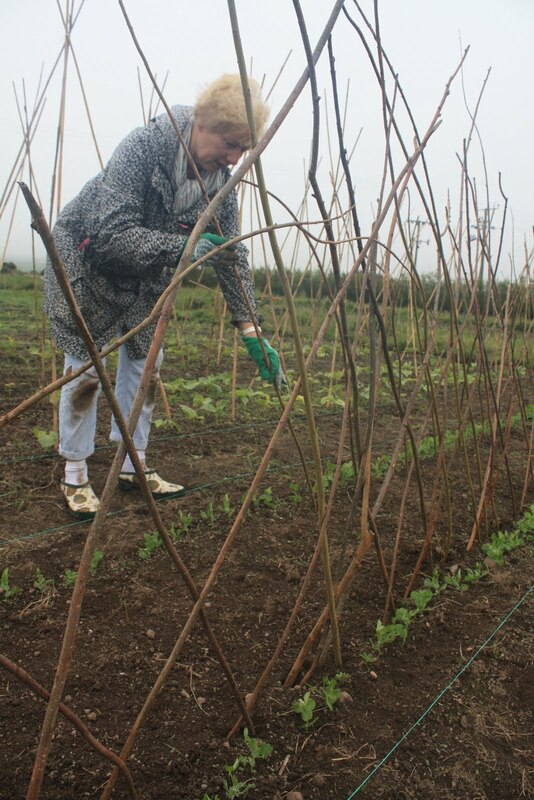 As well as weeding and thinning the four beds of Golden Bantam sweetcorn, we erected bamboo teepees for the runner beans, and wove some willow trellis for the peas. Sonja weaving willow for the peas to climb up. 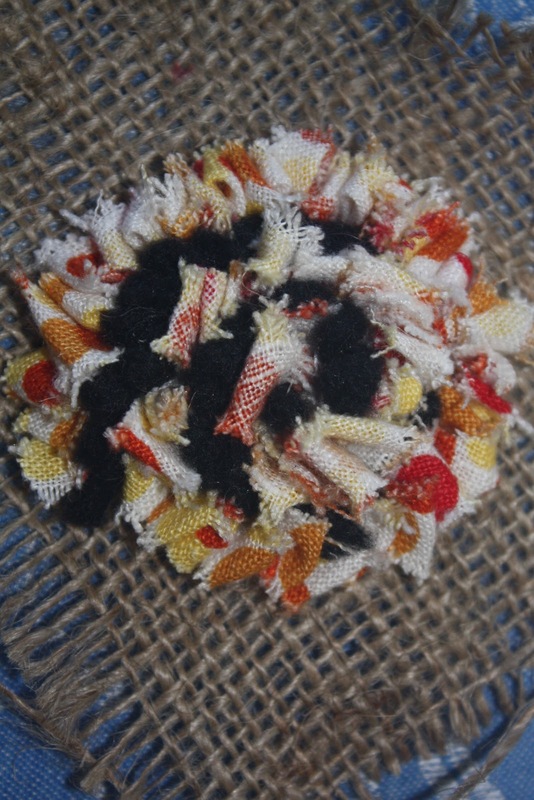 On Saturday 18th June Bosavern Community Farm hosted a rag-rug making workshop led by Sarah Sejahtera, and attended by a group of regular volunteers and other people involved in the farm. Unfortunately we didn't get any photos of the workshop itself as the day was also spent erecting a chicken fence on another part of the farm (fence nearly all up, but gates need building and the bottom of the wire needs digging in! 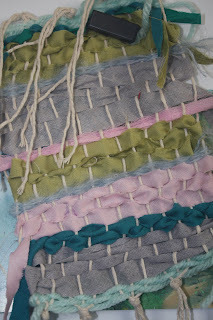 ), but here's some examples of pieces begun on the day. Thanks to Sarah for running the day. There are two special events happening on the farm this week. Thursday evening at 6pm sees June's "Wildflower Discovery Walk" head off around the farm, this month focusing on "weeds" of vegetable gardens and farmland. Then on Saturday afternoon from 2 till 4pm, there will be a free "Composting and chicken keeping" workshop, where we get to meet and discuss the chickens, then concoct a batch of hot aerobic compost. Plus our weekly game of rounders in a farm field at 6pm Friday, and that's another busy week down the farm! Bosavern Community Farm's first two veg-boxes. 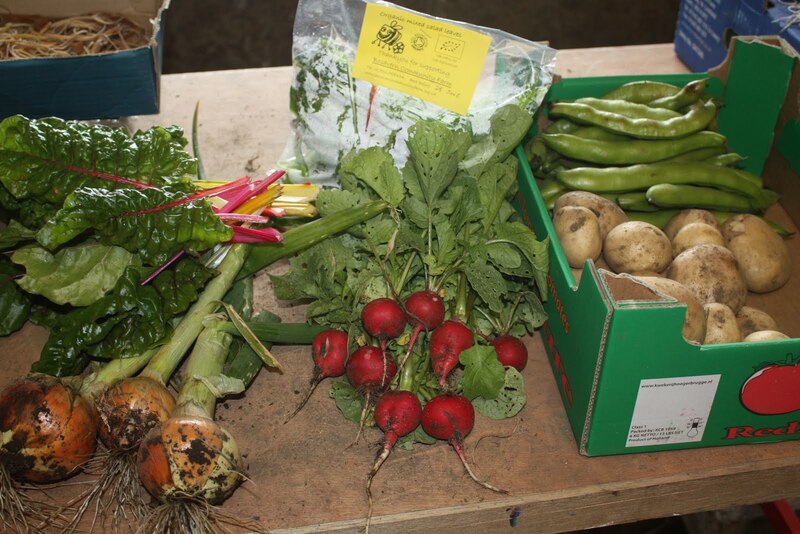 As a trial run, today we harvested and packed two veg-boxes for consumption by Deb and Rob (lucky them! 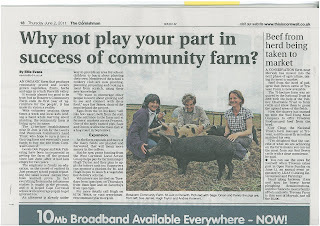 ), two of the "founders" of Bosavern Community Farm. The idea is to start small and gradually increase the number of boxes available as summer progresses and more crops come into production. The boxes will first be offered to our regular volunteers (limited edition veggies!) before being rolled out to the local population later in the year. Our first two veg-boxes all ready for collection. Contents of a veg-box - fresh onions, rainbow chard, radishes, a mixed salad bag, broad beans, and early potatoes. 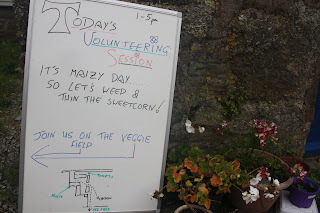 Thanks to Max, our latest volunteer from WWOOF, who has spent the past two weeks helping on the farm come rain come shine. 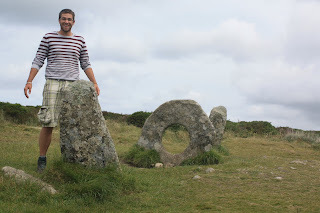 He will leave tomorrow to continue his wwoofing tour of the UK, and we wish him all the best on his travels. 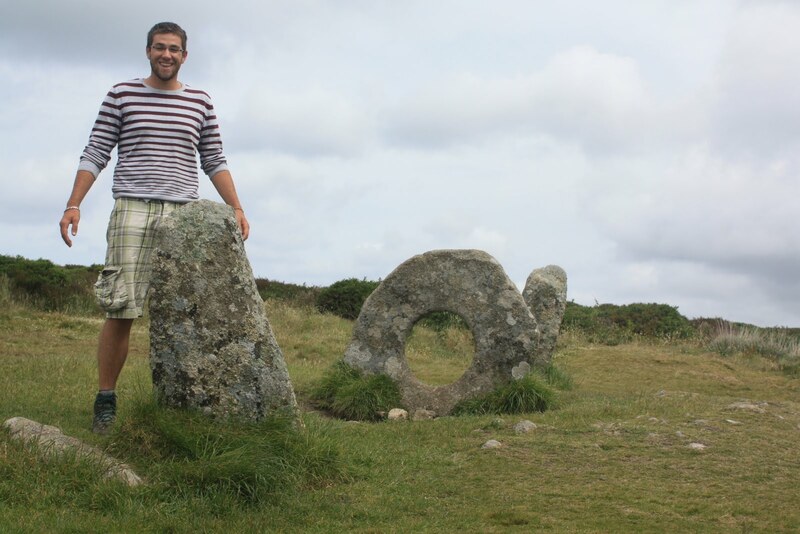 Max on a day out to Men-an-tol historic site. All that hard work in March is now paying off! For the past four weeks we have been selling delicious organic new potatoes at the farm gate (in the shed which is our shop) at £1.50 per kilo, planted and harvested by hand. At first we were selling Maris Peer potatoes, but now we have moved on to Pentland Javelin. 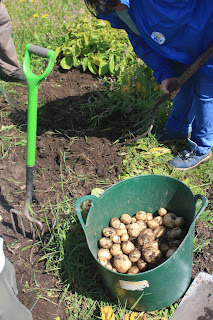 Earthing up the potatoes back in April, with Genevieve, Sonja and grandchildren. 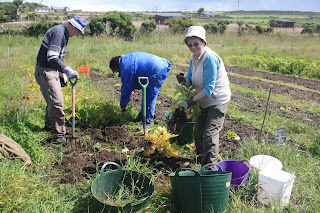 Harvesting the potatoes last week, with Nigel, Ann and Jean. Lovely Pentland Javelin early potatoes. 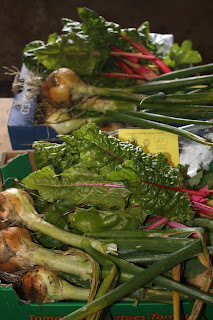 As well as potatoes, today at the gate stall we are selling rainbow chard, eggs, radishes, broad beans, and artist's charcoal. 1) Pick fragrant creamy flowerheads on a sunny day (some say before midday). 2) Shake any insects off flowerheads. 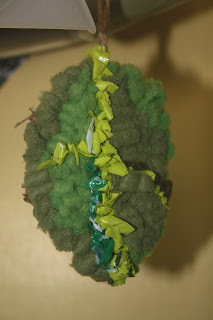 Put flowerheads into a clean bucket with the sliced lemons, pour the water on top, and leave to soak for 24 to 36 hours, stirring occasionally. 3) Strain through muslin and add the sugar and white wine vinegar. 4) Stir until the sugar is completely dissolved, then pour into clean plastic bottles with screw-top lids (you can use glass bottles, but beware of explosions as this gets very fizzy!). 5) Store in a cool place for 2 weeks. If bottles start to bulge let off a bit of gas and re-screw. Drink within 2 months. 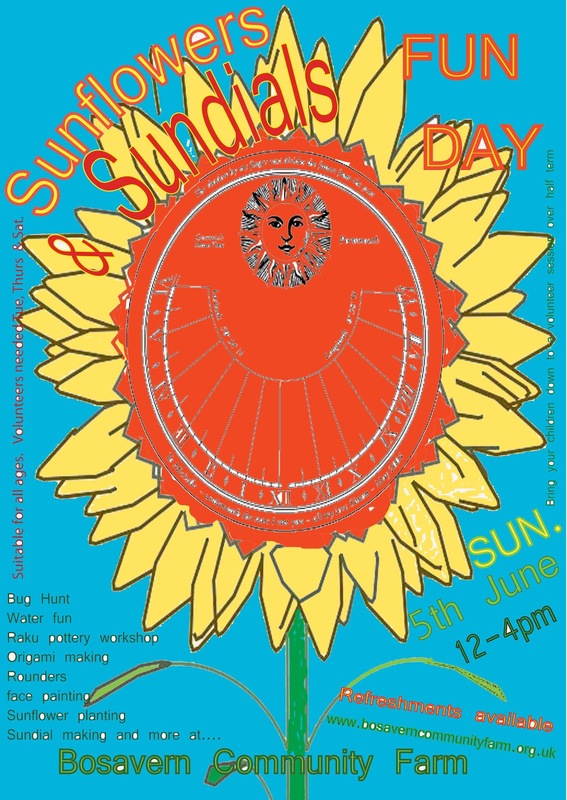 The "Sunflowers and Sundials" summer event down the farm was another swinging success, with 50 people coming along on Sunday 5th June. These events are held by the community for the community, and are only possible due to volunteers giving up their time beforehand as well as on the the day, and to the donations of cakes etc... So as always many thanks to our volunteers - and to everyone who came along and enjoyed the day! Advertising the event on the roadside. Programme of events for the afternoon. Sowing sunflowers into pots to take home. Crafting sundials from wood and pebbles. Making lemonade, and learning origami waterbombs. Face-painting in the grassy courtyard. Game of rounders out in a field. Decorating pottery sunflowers for the raku kiln. Raku pottery demonstration with Catherine Lucktaylor. A pottery mermaid about to surface from the raku kiln. 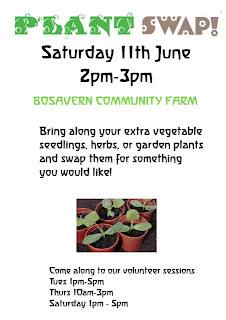 On Saturday 11th June (tomorrow) there will be a plant swap here at the farm at 2pm, so bring your unwanted plants along and exchange them for plants you do want! 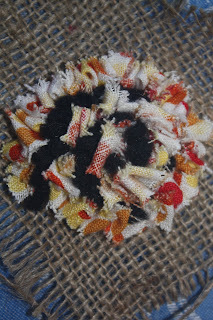 Many thanks to John, who wwoofed with us for two weeks at the end of May and beginning of June. His help was much appreciated on the farm. John produces a fanzine along with a friend - entitled "Bonus Cupped" it's well worth a read if you can find a copy! John, centre, helping prepare a bed on the veggie field. 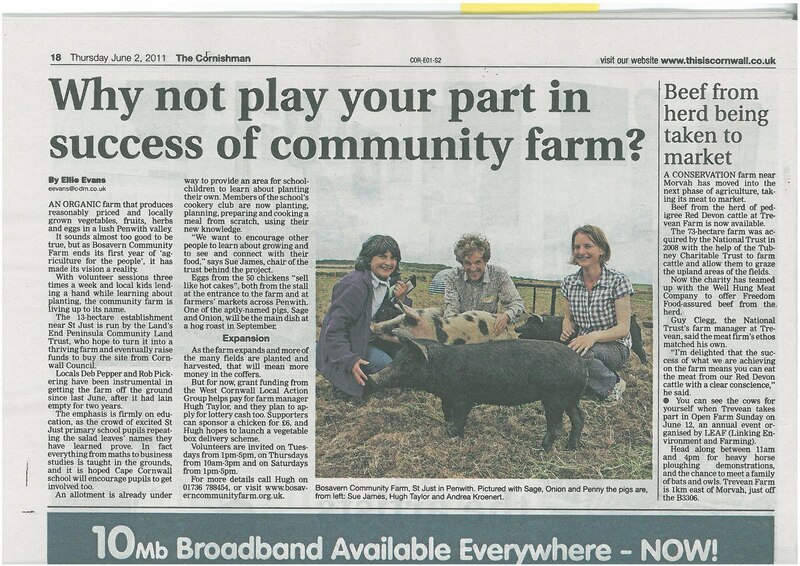 Thanks to Ellie Evans of The Cornishman for the excellent article published in last Thursday's edition, seen above. We enjoyed the company of four extra volunteers on Saturday afternoon after they saw the piece - two of them helped prepare a bed for sowing peas out on the vegetable field, and two sat in sunshine behind the polytunnel and sowed leek seeds into modules whilst drinking in the view towards Land's End from their camp chairs! Thanks for coming, and we hope to see you again. 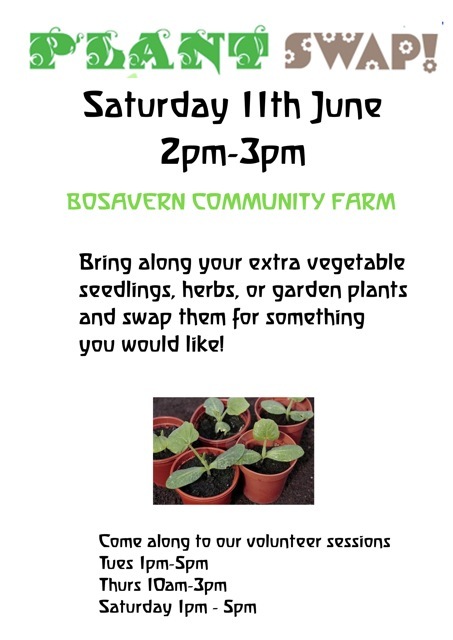 Bosavern Community Farm's next open day event is this coming Sunday, 5th June, with the theme "Sunflowers and Sundials". 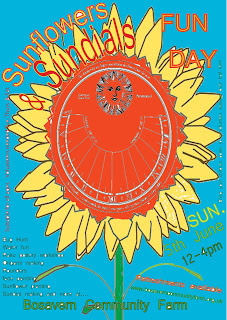 As well as sowing sunflowers and making sundials, there will be refreshments in the farmhouse kitchen, a paper-chase, a water-fight, rounders matches, organic farm produce for sale, and other activities, as well as a raku pottery workshop led by Catherine Lucktaylor (see her website www.AquaLunaArts.etsy.com). The day will run from midday until 4pm, and will be free to all (donations of course are welcome, as are chicken sponsorships!). Many thanks to Emma. 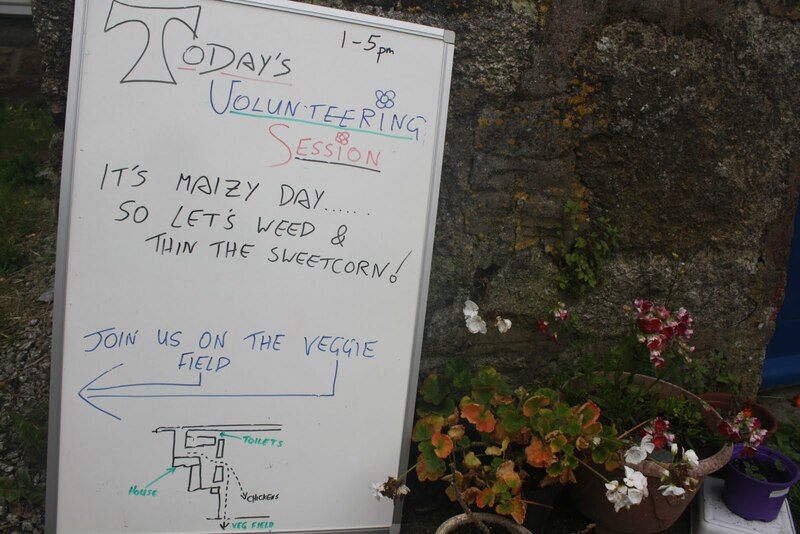 And don't forget, if you want to come along to the community farm and get involved, regular drop-in volunteering sessions are Tuesdays 1-5pm, Thursdays 10am-3pm, and Saturdays 1-5pm. Emma and Sonja sowing mange-tout in the polytunnel.